It was really hard for me to leave New York City yesterday. If it weren’t for my loving little family waiting for me to return home, a job to get back to, and a yoga practice to rekindle, I would have extended my stay just a little longer. The people, the photography course, the food, the energy, it was all mind-blowing. 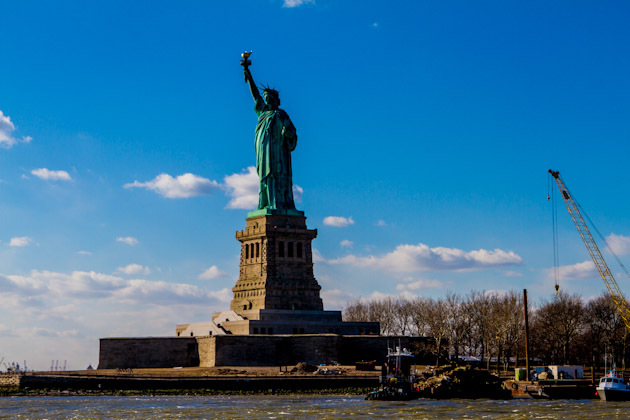 My original purpose of my trip wasn’t to see how many gluten-free restaurants I could find in New York, but after a few fabulous experiences, I quickly became interested in what other awesome food I could chow down on during my stay. Don’t get too excited, jealous or anxious, but I think I’ve found the best gluten-free pizza on the planet. 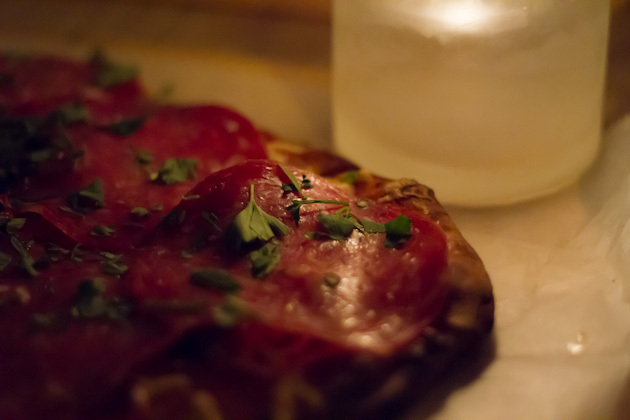 So if the vegan ice cream shop didn’t tickle your fancy, I know that the pizza I enjoyed; and took pictures of, will. Ready for the next set of delicious eats? 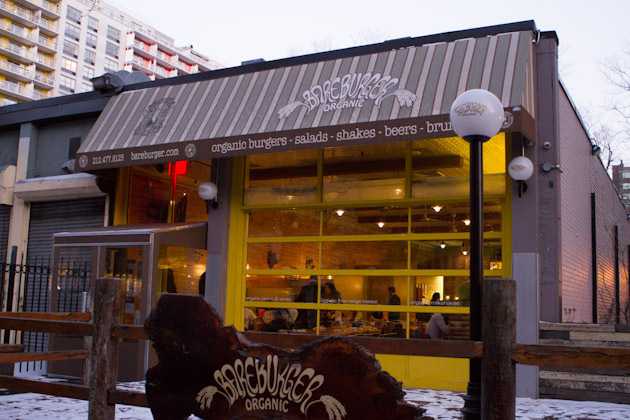 Organic burger joint. Music to your ears? Me too. 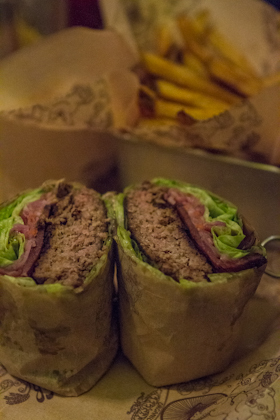 The meats at Bare Burger are organic, all-natural, grass-fed, free range, humanely raised, sustainable and pecticide-free, their prices are great, and they’ve created a menu that really caters to everyone out there. The franchise has done a fabulous job at decorating each of their locations a bit differently, giving each it’s own unique energy. 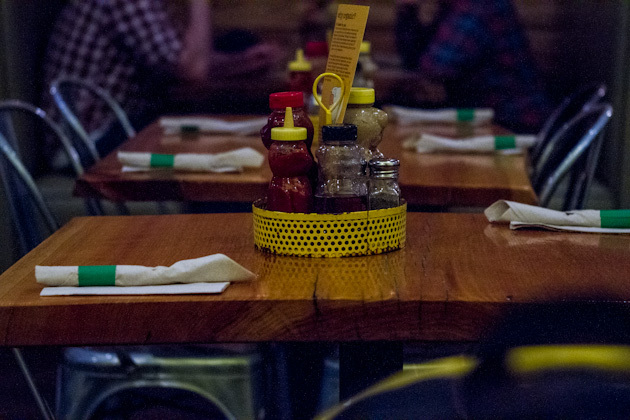 You order the perfect burger at Bareburger a couple of ways. They have a handful of pre-made burger combos with recommendations on which meats to use with which combo, or you can select your own toppings from a large list of yummy burger fillings. Whether you choose to make your own or go with the pre-made selections, you can choose whichever meat: and bun: you want. I chose to go with a Western Bison Burger ($16) with country bacon, Carolina (vegan) slaw and smokehouse sauce in a lettuce wrap with a side of fries and paprika mayo. But it was good. Like, so, so good. That smokehouse sauce is the best BBQ sauce I’ve ever had, hands down. I knew what I was eating was as healthy as an authentic burger and fry could ever be, and I like that! 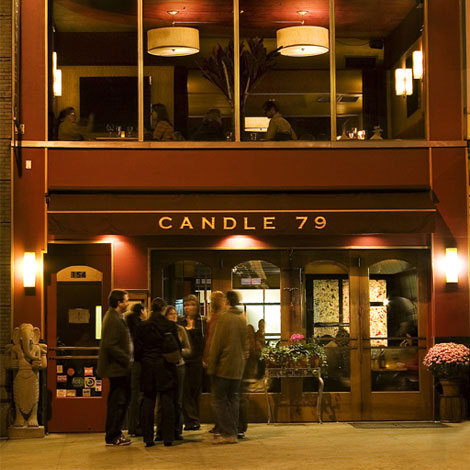 Candle 79 was the #1 restaurant most recommended by all of you when I let you know I was heading to New York. 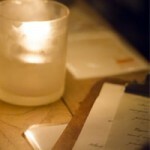 The best meal you’ve ever had, desserts to blow your mind… of course I had to check it out with reviews like that! Silly me, I didn’t make a reservation for my visit and thought I could just get a table on a Sunday at 6pm. The hostesses were super understanding and offered to get me a table at 8pm, but I didn’t want to wait that long. They offered me a spot at the bar; which I would never do, but I figured… why not? I grabbed a seat and pondered over the menu for a long while. In the end, as I did at Pure Food and Wine, I let the waiter’s recommendation lead the way. I ordered a bean and artichoke heart appetizer ($19) and a pomegranate chipotle-grilled tempeh with sweet potato puree, brussel sprouts, green beans, almonds, shallots, mole sauce and fennel ($18). My meal came fairly quickly and was beautifully presented. The appetizer was good, but not phenomenal. I found it to be too oily with minimal flavor and the same with my meal. The tempeh was delicious, but the surrounding puree and veggies were a bit… blah. In fact, I didn’t even know there was a mole sauce until I read the menu again while prepping this post. I’ve never had such a lush vegan experience, but the price coupled with the mediocre meal made me wish I’d gone to Pure Food and Wine for a second time instead of trekking all the way to the East end. 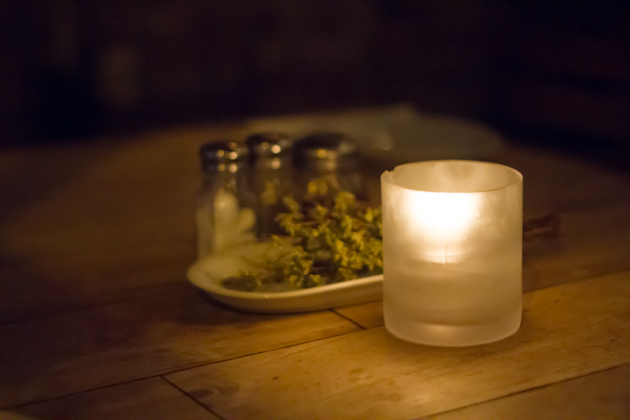 I’m told that Candle Cafe (just down the street) is better and less expensive. I prepared my own breakfast every morning at the hostel so I only visited Juice Generation once when I was majorly in need of a green smoothie near the end of my trip. There was a store right down the street from the subway station which made it perfect to visit before class. 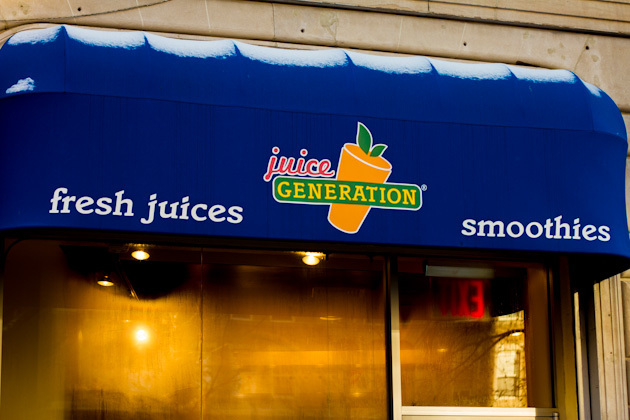 Juice Generation is very similar to any other juice/smoothie bar but what I loved about it was that they had a full-out gluten-free bakery onsite. Gluten-free muffins, galore! All of them had grains, so I didn’t buy one, but they looked absolutely scrumptious. I ended up ordering a pomegranate berry smoothie ($7) and asked them to remove the agave (why add agave to fruit, isn’t it sweet enough?) and add in a couple of handfuls of spinach. It was delicious! And, just because I’d never seen it before, I bought a cranberry crunch bar ($2), too. Man, the US has some of the best food choices, I wish I could find these same bars in Canada. All in all, it was a great experience. 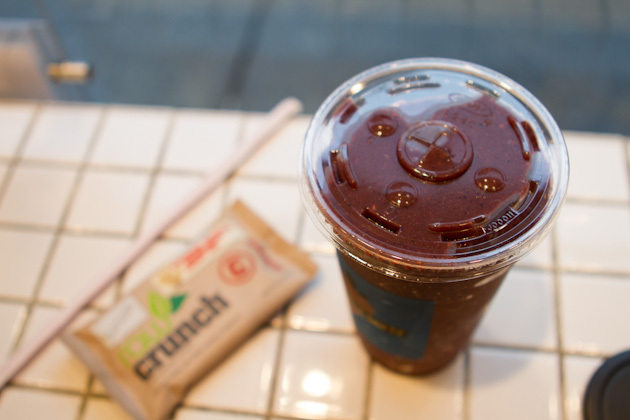 I was in and out in a couple of minutes, the smoothie was nice and thick, good flavors although the berry pieces weren’t broken up all that well – would have liked to see what type of blender they use – and the bar was great, too. 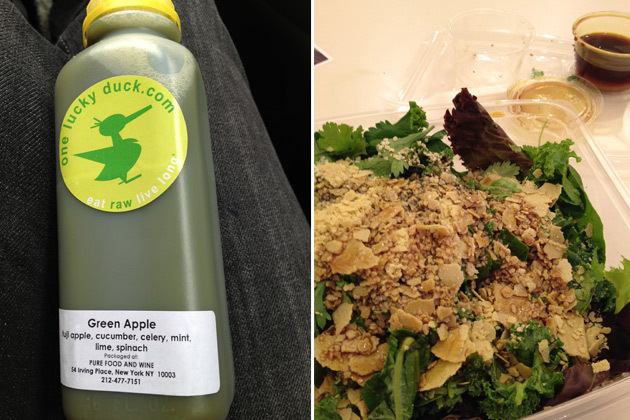 The One Lucky Duck Juice & Takeaway spots around the city are owned by Pure Food and Wine, the restaurant I visited earlier in my trip. I couldn’t leave the city without going back, I just couldn’t. A couple of classmates and I stopped in at the Gramercy location for a round of pumpkin seed and herb salads ($14) and green apple juices ($10). 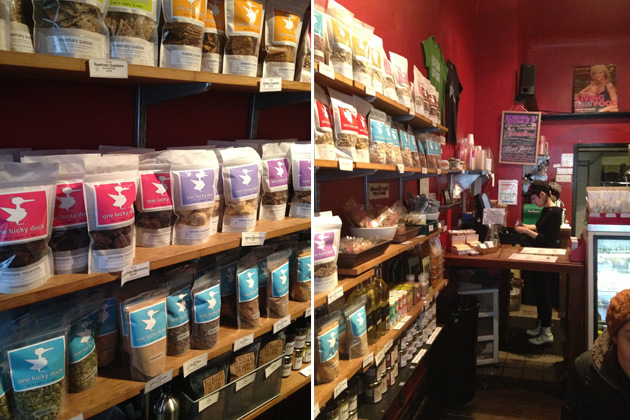 The space is very, very small, with 3 tables, an ordering counter, a handful of staff stuffed in a tiny kitchen and a shelf of yummy raw food snacks. It was crowded and uncomfortable, but I didn’t care. We waited about 10 minutes for our food and took it back to class to enjoy. As expected, the salad was out of this world amazing. The macadamia nut Parmesan was so flavorful and melted into the dressing beautifully, the salad dressing was light, and all the mixed herbs were so fresh and tantalizing. The juice however, wasn’t that fabulous. It wasn’t fresh pressed juice, but had been made (maybe that morning? ), bottled and kept in the fridge. At $10 a serving, I had hoped that it would have been fresh juice. The flavor was great, but it didn’t taste as alive as it could have. I’ve had a lot of gluten-free pizza in my time. Most of it homemade, some of it store-bought, and just a handful of times, enjoyed at a restaurant. Wait, enjoyed isn’t the right word here…. tolerated. 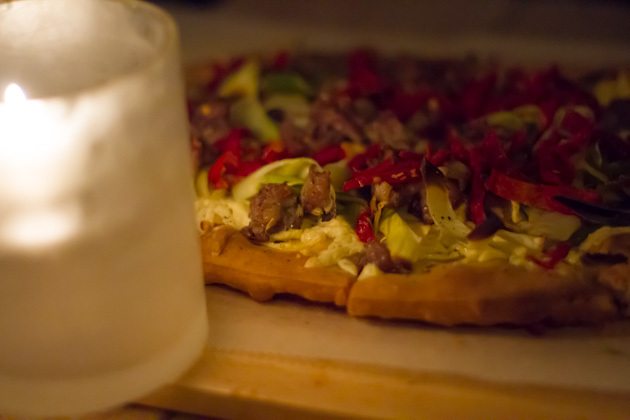 Gluten-free pizza dough is good… but it’s not great. Something I will never say again because the folks at Pala have their gluten-free pizza and overall menu down to a complete science. 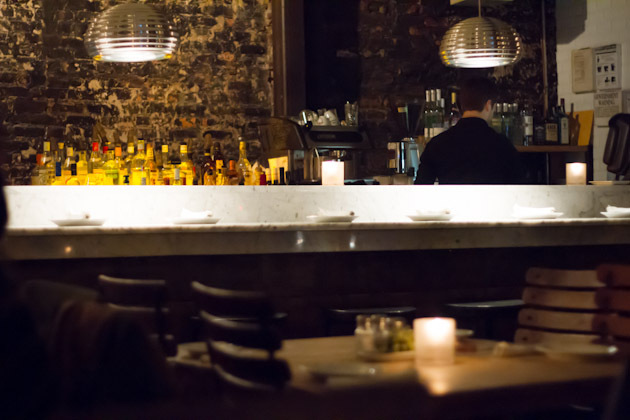 From the original black brick wall, to the small personal accents throughout the space, the authentic pizza ovens as the focal piece to the open space kitchen, and the charming tables, this New York pizza spot has it going on. Oh, did I mention they have Daiya cheese, too? All of their pizzas can be made on a gluten-free crust, and 3 of the 11 meat pizzas can be made with daiya cheese instead of normal cheese. My fellow photography pal, Connie and I chose to order two different pizzas and share between the two of us. We ordered the Porri e Salsiccia pizza with pork sausage, leeks, sundried tomatoes, pink peppercorns, hot pepper ($16) and the Inferno pizza that had cherry tomato sauce, spicy soppressata, and fresh parsley ($17), both with light Daiya cheese and gluten-free crust. The crust is made from a combination of garbanzo, rice, tapioca and sorghum flours. Our waiter also let us know that there was soy lecithin in the crust, but that people with soy allergies hadn’t had issues with it in the past. It was the best meal I enjoyed during my stay, right up there with Pure Food and Wine. Holy moly, it was good. So there you have it…. 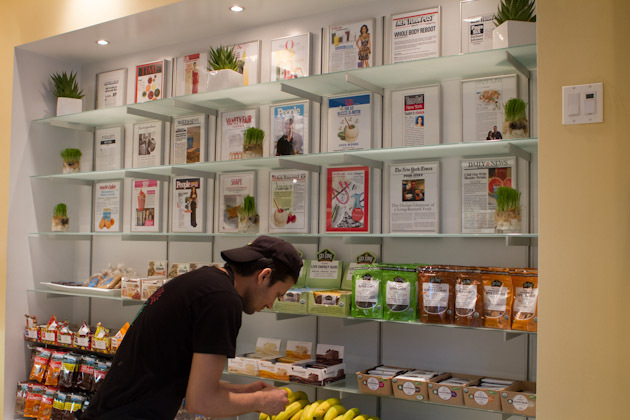 7 New York Restaurants that cater to us allergen-free living folks and that are sure to blow your socks clear off if/when you give them a try. If you’re ever planning a trip to New York City and want to reduce costs as much as possible, I highly recommend staying at the HI New York City – Manhattan Hostel. There are multiple markets nearby to get fresh food, it’s close to the subway, safe, and inexpensive. It was a fabulous trip, but I’m at home feeling pretty heavy and bogged down, if you know what I mean. I ate pretty healthy and balanced during my trip, but my body is definitely asking me to take it easy this weekend. I think I’m going to be doing a little juice cleanse in the coming days. Care to join me?